Big news in Pittsburgh: the city’s last post-industrial brownfield is no more. Hazelwood Green, a new mixed-use, environmentally sustainable neighborhood, is rising on 178 acres along the Monongahela River where steel was once manufactured. “Pittsburgh has been transitioning its economic base for the past few decades and is now emerging as a global leader in the innovation economy that is being fed in great part by our world-renowned universities,” says ReMake Group‘s Rebecca Flora, Hazelwood Green project director. 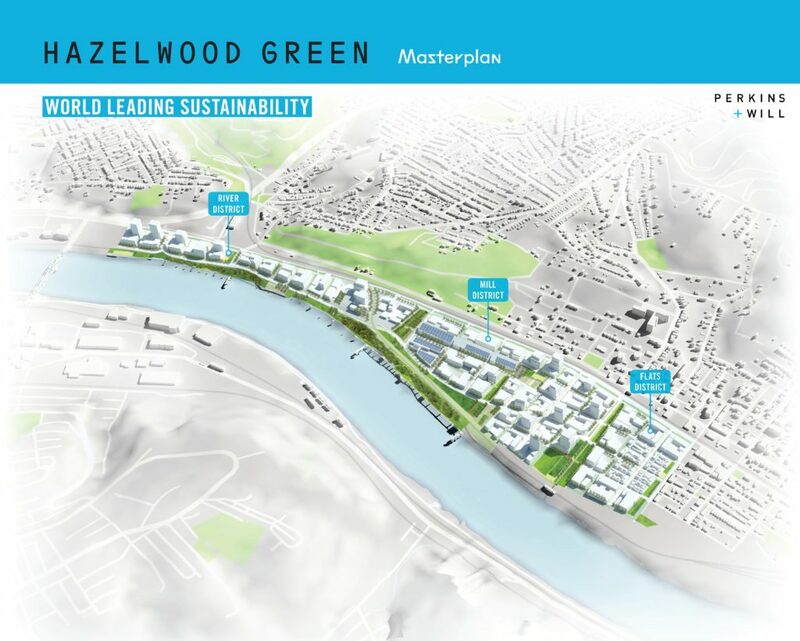 “The Hazelwood Green site is a capstone project in many ways — it represents years of work by many to transform Pittsburgh’s image, riverfronts, economy and environment. Almono LP, a consortium of Pittsburgh foundations, acquired the site in 2002. Since then, one million cubic feet of fill and grading have been completed, along with substantial environmental and stormwater remediation. A master plan by Perkins + Will will be submitted to the City for approvals soon, the design of a new 2.5 acre park is about to get underway, and construction will begin in 2018 on an “urban-designed” Main Street. Pittsburgh’s Advanced Robotics for Manufacturing Institute has signed on as the first office tenant and will lease two-thirds of the 94,000-square-foot Mill 19 Building, a 1943 mill structure. Another 42 acres are currently licensed to Uber for a test track. Eventually Hazelwood Green will accommodate a wide range of uses: offices, research and development, light manufacturing, housing, retail, parks and public green spaces, trails and transportation, and community services. According to Flora, full build-out could take 20 years and comprise as much as 10.5 million square feet of space. Underlying the work is a commitment to the environment and the surrounding neighborhood. Hazelwood Green will adhere to the U.S. Green Building Council‘s LEED for Neighborhood Development standards. The district plan aspires to net-positive building energy and a “complete streets” approach that focuses on automotive, bike and pedestrian safety. Hazelwood Green also hopes to catalyze investment and grow jobs in surrounding Hazelwood, an underserved neighborhood that has gone from 13,000 residents in 1960 to about 5,000 today. Lead image by Annie O’Neill.